The scene represented in this painting by Monet is a tow-path along the Seine River in Argenteuil. In the past, horses pulled barges along the river from the tow-path. Monet lived in Argenteuil for six years in the 1870s, during which time the town changed quite dramatically. Since it was only a short distance from Paris by train, many new factories were built, which attracted workers from the city. If you look carefully into the distance in this Monet's painting, you can see some of the smokestacks of the industry at Argenteuil. SPECIAL NOTE : The painter will make the reproduction as close to the original oil painting as possible. 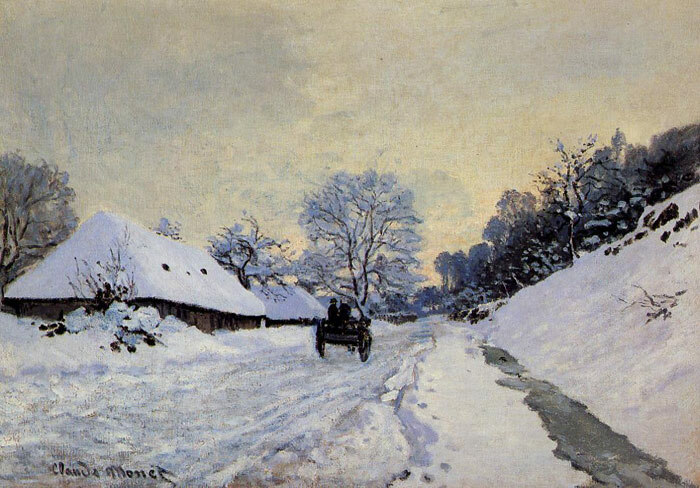 If you want your painting to alter from this likeness, please email us and " A Cart on the Snow Covered Road with Saint-Simeon Farm, 1865	" will be reproduced according to your special requirements.